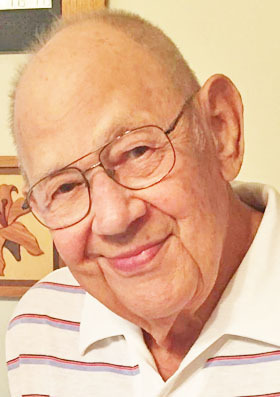 EAST PALESTINE — Earl L. Huffman, 87, a longtime resident of East Palestine, died Thursday at his home surrounded by family. He was born Sept. 20,1931 in Beaver Falls, Pa., a son of the late Clarence and Rose Boden Huffman. He was a member of the First Presbyterian Church in East Palestine and a founding member of the Unity Fire Department. He retired from Babcock and Wilcox after 23 years of employment. Previously he was employed with Kenmar for a number of years. He is survived by his wife of 69 years, Thelma St. John Huffman; three children, Barbara Kliner of East Palestine, Daniel L. (Diane) Huffman of Longview and Edward A. Huffman of East Palestine; two grandchildren and three great grandchildren; and his best friend and “talking buddy” Tom Cartwright. Besides his parents, Earl was preceded in death by two grandchildren. A private graveside will be held at a later date at New Waterford Cemetery. No public services will be observed at this time.